No Xi, no Putin, no Modi. No Trump, no Macron, no May. Merkel could hardly be billed as a chart-topper. 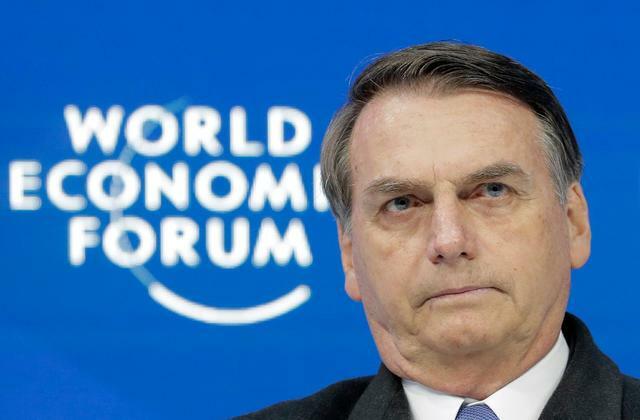 Facing no competition, Brazilian President Jair Bolsonaro, the former paratrooper gleefully adopted by Western media as “the Trump of the tropics”, could not possibly be upstaged at the World Economic Forum (WEF) in Davos as the new savior of global capitalism. The Davos Man (and, in much-reduced scale, Woman) was quite intrigued by the debutante’s first dance in the geoeconomic ballroom. After all, he had been promising privatization a-go-go, tax cuts, the definitive defeat of “the communists” and an unprecedented fire sale of juicy Brazilian assets. That sounded better than caipirinhas – the national cocktail – in the sun. Well, the dream lasted a full six minutes. Bolsonaro said he “took office amid a great ethical, moral and economic crisis” and now he would change history. He stressed his ministers are committed to cracking down on corruption and money laundering. Well, perhaps not corruption by his son Flavio, already involved in a multi-pronged scandal that walks and talks like, well, money laundering, mixed with a dodgy association with a death squad, The Crime Bureau, in Rio de Janeiro. Bolsonaro though was adamant; Davos Man and Woman should feel safe to visit Brazil – with their families – without becoming a hostage in an Elite Squad remix. On the international stage, he swore relations would be more “dynamic” and with no “ideological bias” under new Minister of Foreign Relations Eduardo Araujo, a former low-level diplomatic nullity who believes the acronym “BRICS” is a satanic invention. Well, these lungs of Planet Earth may be destined to Sahara status, as Bolsonaro has already transferred the control of Brazilian indigenous reserves to the Ministry of Agriculture, a de facto subsidiary of the powerful agribusiness lobby. Lord Nicholas Stern, of the London School of Economics, wrote a very good, detailed report on the economics of climate change. He also said he raised the need to protect the Amazon rainforest with Bolsonaro’s top Chicago Boy and finance czar Paulo Guedes, when they met in Davos. It’s easy to imagine the reaction of Team Bolsonaro at Sir David Attenborough, plugging his new Netflix series, decreeing to Davos Man (and Woman) that the Holocene has ended; the Garden of Eden is no more; and human folly towards the environment has pushed us into a new geological age, the Anthropocene. In the Saving Global Capitalism chapter, Bolsonaro remained on strict Davos script: low taxes, “reforming” social security, mega-privatizations, and lifting the “heavy weight” of the state. He clinched it with “God above everything”; that was certainly more Trump than Xi. And then he was gone, replaced by Mike Pompeo via satellite. A case can be made that 1,500 private jets fighting for parking space plus a perpetual limo traffic jam – talk about environmentally conscious elites – made more impact at Davos than Bolsonaro’s six minutes of fame. Robert Shiller, the 2013 Nobel Laureate for Economics, said Bolsonaro “scares him”. A Looney Tunes element was also in play. The English version of the minimalist interview the president gave when he arrived at Davos – he later skipped the required press conference – revealed that at the top of the Bolsonaro government no one speaks decent English. And a day before even his ministers and close advisers didn’t know what he was going to say. No wonder the proverbial mass of “foreign investors” would rather point their champagne glasses toward the genuine article: China. On the global financial risk panel, the vice-chair of China Securities Regulatory Commission, Fang Xinghai, stressed: “We should not overreact. China is slowing down but it’s not going to be a disaster”, adding that Beijing’s strategies have constantly “avoided financial crises over the last 40 years”, something that never happens in G-7 territory. City of London voices are predictably echoing Davos in their utmost fear of “populist authoritarians” and “illiberal democracy” – complete with the condescending addendum that even though Trump may be a right-wing populist with authoritarian traits, like Bolsonaro, he’s less threatening because he’s controlled by “US institutions”. With pitiful insight like this, Davos Man (and Woman) could do worse to understand which way the wind is blowing than plunge into ‘Twilight of the Elites: Prosperity, the Periphery, and the Future of France’, by geographer Christophe Guilluy, just translated into English by Yale University Press. Writing two years before the advent of the Gilets Jaunes – Yellow Vests, Guilluy convincingly shows how, once again, it’s all about class struggle. But now, the working class “refuses any longer to be enslaved by their old political and cultural masters”. No wonder Macron skipped Davos; he’s got to deal with the real thing (and he doesn’t know how). May Davos survive as a discarded sketch of the 50-year-old Monty Python’s Flying Circus. And no, the fire sale of “paradise” Brazil won’t save global capital. Pepe Escobar is correspondent-at-large at Asia Times. His latest book is 2030. Follow him on Facebook.